Thursday the 26th of July saw the debut of the Angry Birds karting team. The karting team was made up of one current racing driver, Clare Vale, one ex racer, Shaun Sweet along with three newbies – my girlfriend, Taryn Miles, her brother Nathan Miles, and Alex Boryna. The last member of the team is myself, I have grown up around racing and have had a bit of experience in 12 hour endurance karting. 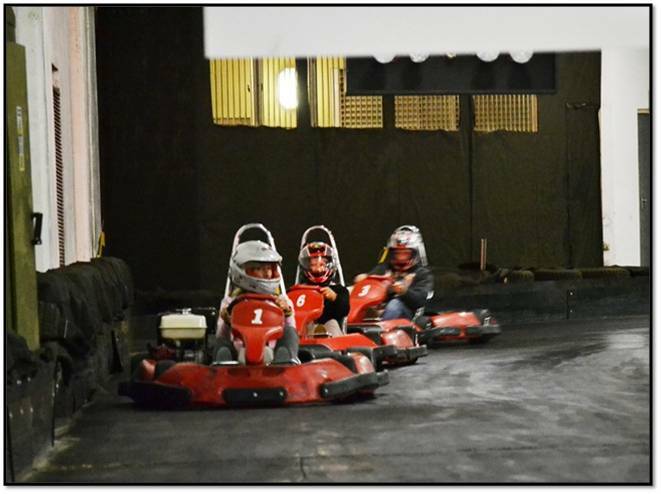 The karting league is held at the Xtreme Karting Circuit in Sunninghill and is held twice a month over three months making a total of 6 rounds. We decided to enter a team after a very fun evening spent challenging friends and family around the circuit. It has by far the best and neatest indoor karts that I’ve raced in Johannesburg! We managed to get a practice session in before our first race, just to get a feeling for the track and see if we could find some more time. Steady improvements were shown on a slippery track and the opportunity was used to learn a lesson or two from the experienced drivers. We were getting ourselves race ready! We arrived on Thursday night with both apprehension and anticipation. I think our aim for the first event was to be competitive and to improve our times. A side goal was surely to not finish last! Clare and I did the 10 minute qualifying session; each spending about 5 minutes on track. We managed to qualify in fourth position (5 competing teams). I did the quickest lap in our qualifying session by 0.02 of a second; it was very even out there! The race is a two-hour endurance event with pit stops for every team, every 10 minutes. Teams have to have at least three members. We decided to run 6 of us as we felt it would make it more fun, and for people who are not karting fit, two 10 minute sessions are quite tiring! We sent Shaun out first and he did very well; when he pitted, we were running 3rd with Shaun doing a 16.33, faster than any of us had done! Things were going well! We sent Alex out next and although he didn’t manage to hold onto 3rd he kept us competitive in 4th and setting personal best after personal best as he went. Taryn was next and bettered her previous best by over a second while holding on to a strong 4th. We then sent out Mrs Fast, Clare Vale, who set a best of her own but was not as quick as Shaun. We strengthened our grip on 4th, remaining competitive for a podium finish. Next up was Nathan, who impressed us all with his times and consistency, also setting a personal best in his session. By the time I got into the kart for the last session in the first hour, we were running well in 4th. I aimed to get good lap times, pass a few people and most importantly not get passed! I managed to hold my own even though there was a power failure mid race! Being underground made it a properly nerve wracking moment as darkness enveloped the arena! Luckily I managed not to hit any barriers, which is not what could be said for all competitors. The lights came back on and so did the race. I managed to make two passes and didn’t get caught so was relatively happy with my session! The second sessions saw everyone get to the previous personal bests and in the case of Alex, Taryn and Nathan, better them again! Clare battled with a kart that started running out of fuel and surging around the corners, and the team lost some time in the pit stop while refuelling took place. I took the last session and managed to pass a few people. This time we didn’t have a black out, making the drive a lot more relaxed! We held onto 4th for the flag and we’re now even more excited for round 2! The Angry Birds team are now ready to race more!